I've been fortunate to have most of these book projects more or less fall into my lap. I was contacted some time ago by the principle behind Fonthill Media, asking if I would be interested in doing any books for them. 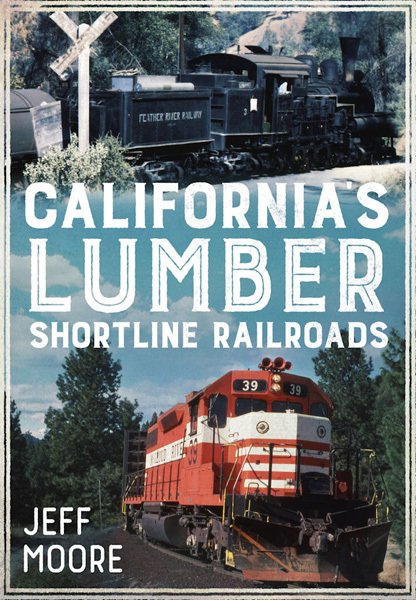 This was one project that immediately came to my mind, as it is a subject in which I've always had a strong interest, and a lot of the coverage out there focuses heavily on logging railroads with minimal coverage to the common carriers connecting many California sawmills with the outside world. This book has a lengthy introduction, followed by individual chapters on the Almanor, Amador Central, Arcata & Mad River, California Western; Camino Placerville & Lake Tahoe; Eureka Southern/California Northern/North Coast/Northwestern Pacific; Feather River; Great Western/Lake County/Modoc Northern/Lake; McCloud River; Quincy; Sierra; Yreka Western; and Other railroads. Each featured railroad has a brief corporate and operational history, a map, and a basic locomotive roster. There are a few minor errors and corrections that crept into the text. 1. Eureka Southern locomotive roster, Page 90. Headings should have been for locomotives 30/31 and 32/33, not 31/31 and 31/32. 2. Sierra Railroad, Page 140. John Bullock should have been Thomas Bullock. 3. There are one or two hanging commas and the like. Any other errors or corrections will be noted here as I discover them. This book is published by Fonthill Media and distributed in the US by Arcadia Publishing/The History Press.